EveryAugust, just when many peoplego vacationing in the country where skies are dark, the best-knownmeteorshower ? the Perseid meteor shower ? makes its appearance. The"shootingstars" promise to deliver an excellent show this year toanyone withclear and dark skies away from urban and suburban lights. Theevent is also known as"The Tears of St. Lawrence." TheSaint's death was commemoratedon his feast day, Aug. 10. King Phillip II of Spain built his monasteryplacethe "Escorial," on the plan of the holy gridiron. And the abundanceof shooting stars seen annually between approximately Aug. 8 and 14have cometo be known as St. Lawrence's "fiery tears." Weknow today that these meteorsare actually the dusty remains left behind by the comet Swift-Tuttle.Discovered back in 1862, and most recently observed in 1992, this comettakesapproximately 130 years to circle the sun. With each pass, CometSwift-Tuttleproduces a debris trail along its orbit to cause the Perseids. Everyyear during mid-August, whenthe Earth passes close to the orbit of Swift-Tuttle, the material leftbehindby the comet from its previous visits ram into our atmosphere atapproximately37 miles per second (60 km/second) and creates bright streaks of lightin ourmidsummer night skies. Accordingto the best estimates, in 2010 the Earth is predicted to cut throughthedensest part of the Perseid stream sometime around 8:00 p.m. EasternDaylightTime on Thursday. Thebest window of opportunity to see the shower will be the late-nighthours ofWednesday on through the first light of dawn on the morning ofThursday, andthen again during the late-night hours of Aug. 12 into the predawnhours ofAug. 13. TheMoon, whose bright light almost totally wrecked last year's shower,will havezero impact this year; unlike last year when it was just a few dayspast full,this year it will be new on Monday, Aug. 9, meaning that there will beabsolutely no interference from it at all. Avery good shower will produce about one meteor per minute for a givenobserverunder a dark country sky. Any light pollution or moonlight considerablyreducesthe count. However,observers with exceptionalskies often record even larger numbers. 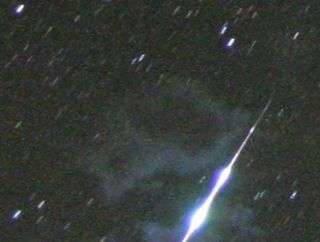 Typically during an overnightwatch,the Perseids are capable of producing a number of bright, flaring andfragmenting meteors, which leave fine trains in their wake. Onthe night of shower maximum, thePerseid radiant is not far from the famous "Double Star Cluster" ofPerseus (hence the name, "Perseid"). Low in the northeast during theearly evening, it rises higher in the sky until morning twilight endsobserving.Shower members appearing close to the radiant have foreshortenedtracks; thoseappearing farther away are often brighter, have longer tracks, and movefasteracross the sky. Aboutfive to 10 of the meteorsseen in any given hour will not fit this geometric pattern, and may beclassified as sporadic or as members of some other (minor) shower. Asidefrom the predicted peakhours, Perseidmeteor shower activity always increases sharply in the hoursaftermidnight. We are then looking more nearly face-on into the direction oftheEarth's motion as it orbits the sun, so the atmosphere above you scoopsup meteorslike the windshield of a car catching bugs. From around 2 a.m. untildaybreakyour local time, the Perseids promise to put on a good display, weatherpermitting. Makinga meteor count is as simpleas lying in a lawn chair or on the ground and marking on a clipboardwhenever a"shooting star" is seen. Watching for the Perseids consists of lyingback, gazing up into the stars, and waiting. It is customary to watchthe pointhalfway between the radiant (which will be rising in the northeast sky)and thezenith, though it's perfectly all right for your gaze to wander. Countsshould be made on severalnights before and after the predicted maximum, so the behavior of theshoweraway from its peak can be determined. Usually, good numbers of meteorsshouldbe seen on the preceding and following nights as well. The shower isgenerallyat one-quarter strength one or two nights before and after maximum. Afew Perseids can be seen as muchas two weeks before and a week after the peak. The extreme limits, infact, aresaid to extend from July 17 to Aug. 24, thoughan occasional one maybe seen almost anytime during the month of August. As a bonus every evening now throughhe heart of the Perseidmeteor shower, threebright planets are tightly clustered just after sunset.Venus, Mars andSaturn are easy to spot in the southwestern sky as soon as darknessfalls. Joe Rao serves as aninstructor and guest lecturer at NewYork's Hayden Planetarium. He writes about astronomy for The New YorkTimes andother publications, and he is also an on-camera meteorologist for News12Westchester, New York.